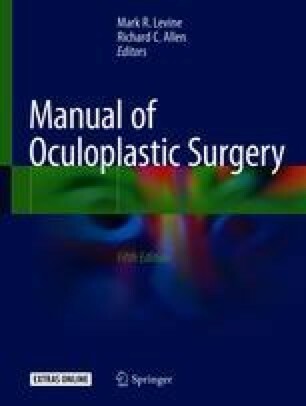 This chapter describes various options for managing involutional entropion. There are three lower eyelid aging changes responsible for involutional lower eyelid entropion: increased horizontal eyelid laxity, partial or complete dehiscence of the lower eyelid retractors, and unopposed overaction of the lower eyelid pretarsal and preseptal orbicularis muscle. Involutional entropion can be constant or recurrent as well as unilateral or bilateral. Patient complaints include ocular irritation, redness, and tearing. Nonsurgical management options for this problem include artificial tear ointments, lid taping, and botulinum toxin injections. Rotation sutures are a temporary surgical option. Surgical options have included plication of the lower lid retractors combined with a tarsal strip or a full-thickness wedge resection of the lower lid. Entropion recurrence has been a problem with all of these interventions. A transconjunctival entropion repair, which combines a tarsal strip, retractor plication, and excision of overacting orbicularis muscle, corrects the three anatomic defects associated with an involutional entropion and permanently corrects involutional entropion. The online version of this article ( https://doi.org/10.1007/978-3-319-74512-1_23) contains supplementary material, which is available to authorized users.